A few years ago, I'd suggested that we could both boost foreign student numbers and attract skilled migrants by guaranteeing permanent residence for foreign students earning a reasonable degree at one of our main universities. While it is true that students can get a 12-month open work visas and that students with job offers can get longer-term visas, it's also true that employers will be reluctant to offer jobs to international students soon to graduate where it then means they have immigration hassles afterwards: they can't tell that the student on an open work visa will get the longer term visa, and they risk losing the new employee if the immigration process falls over. Permanent residence by default, barring failure of a criminal background check, would get rid of this problem. Further, because potential students would have certainty that they would be able to stay here on graduation, they would rank New Zealand schools a few places higher in their international applications. The Timaru Herald's revisited that call. I got an email from them the other day asking if I still liked that idea; they've been finding employers having big problems in getting skilled staff who like the idea of granting permanent residence to new graduates. They reported on it today. A South Canterbury employer says an economist's proposal to grant international students permanent residency on graduation could ease skill shortages. Economist Dr Eric Crampton says the Government should automatically grant permanent resident status to foreign students who graduate with Bachelor's degrees from major New Zealand universities. Crampton, the New Zealand Initiative think-tank's head of research, said the scheme could "do double duty in reducing skills shortages and in supporting the tertiary sector" by encouraging international students, who pay relatively high fees compared with domestic students, to study in New Zealand. Polarcold Stores chief executive Kevin Cahill said yesterday the proposal "makes a lot of sense". Students on the 12-month open work visa still have huge problems in securing work because employers just cannot tell whether the student will be able to stay on. One of my former students at Canterbury was in on a student visa. If there were any student I'd ever taught on whom I'd place a bet on "will be incredibly successful in business", it was him. Ridiculously good. And while on a student visa, his English was superb - better than most Kiwi students. And he still butted up against employer reluctance to take on that work visa risk. This is a real and significant barrier to even really really great students who'd add just a ton of value to firms. The policy would bring in more international students, helping to cross-subsidise domestic students. I put strong odds on the Immigration bureaucracy's telling the Minister, "Oh, it's more complicated than you think, we'd be outsourcing immigration policy to the Universities, we'd need to be policing the Universities to make sure their processes are robust, and the students can already get that open work visa so there is no problem to be solved." All of that's avoidable: TEC knows how to police this stuff subsequent to the CPIT Cool-IT rort. And the open work visa really doesn't seem to be enough. I hope MBIE runs with this one. It could do a lot of good. The Labour Party's come out against zero-hour contracts: an employment practice where employees have to be on call for what shifts might come, but with no particular guarantees of how many hours might come or when those hours may be required. Jim Rose discusses things in a four-post series, which takes a more academic take on the question. Here, Jim argues that a good start would be reckoning why employers and employees would agree to the deal in the first place. Unless labour markets are highly uncompetitive with employers having massive power over employees, employers should have to pay a per-hour premium if zero-hour contracts are a hassle for workers. If we see zero-hour contracts in Christchurch, for example, I don't think we can first-cut look to power as the answer: plenty of labour demand there. In the second part, Jim notes that the fixed costs of employment are such that you shouldn't expect zero-hour contracts: you'll typically do better with one 40-hour worker over two 20-hour workers barring some kind of mandatory benefit for 40-hour workers. I don't think there's any set benefits threshold that obtains for 0-hour contract workers as compared to 20-hour workers though. Each additional employee means recruitment, overhead, HR and training costs; why pay all that out on somebody who might only work 3 hours a week? You might do it if there are strong and somewhat unpredictable fluctuations in product demand. Jim notes premiums for part time jobs in seasonal industries; I'd also expect some of those employers could also see advantages of zero-hour contracts. If it's raining, you're less likely to send a team of fruit-pickers out; when it's sunny, you need all hands on deck. Jim expects, rightly I think, that zero hour contracts would be most likely in jobs with low recruitment costs and where specialised training needs are low. While you might think that could point to potential power issues, think twice: specialised skills can be more likely to make you beholden to particular employers. In part 3, Jim expects workers with low fixed costs of working will flip into the zero-hour sector while those with higher fixed costs would prefer lower hourly rates but more guaranteed hours. Again, read "lower" here as meaning "relative to what they could elsewhere earn". Finally, Jim relates all this back to problems of team production. Jim makes one big and important point in all this: unless we have a good idea about why firms are moving to this contract structure, and why employees are sticking with it rather than flipping instead to other employers, meddling in the arrangements via policy is pretty risky. Ok. Since moving to Wellington, we've seen Circa Theatre put on a production of Little Red Riding Hood and Bats put on a production of Richard III. We thought the former would be good for the kids: it was an early enough show and was advertised as pantomime. The opening musical number was a lengthy rant on the evils of the National Party. The Big Bad Wolf was a scary awful developer who wanted to collude with evil scary politicians to turn some park in Karori into apartment blocks. We ducked out at half-time as the show was running really long and we were past the kids' bedtime - they're normally to-bed around 7, and we'd been expecting an hour-long kids kinda show. Our fault on due diligence. The final Act of Richard III had Richard the Third's face on a National Party 2014 election placard in place of John Key's, and Henry VII's face in place of Cunliffe's on a Labour hoarding. The play's leaflet apologised for the strong partisanship in this performance, but because they just hate National so much and because they thought it was so apt, they hoped nobody minded too much. Both plays were fun and I enjoyed them, but it's hardly unprecedented for tax-funded arts types to go all-out on how much they hate the government (if National's in office), markets, economists, developers, and businessmen. I might be misremembering, but I thought I saw various government funding body seals on both programmes. Anyway, today a bunch of people got mad on Twitter that Eleanor Catton, a NZ novelist, complained about NZ's neoliberal profit-loving, culture-hating politicians. Half of them were mad she'd said that; the other half were mad anybody might complain that she'd said it; and some other half entirely were mad at Sean Plunkett. My Twitter filters must be getting better as I didn't see any of it until somebody pointed me to it. Catton's complaint is self-refuting: no neoliberal, profit-loving, culture-hating government would keep giving so many grants to so many productions that spend so much time complaining about our neoliberal, profit-loving, culture-hating government. John Key's disappointment that she doesn't like him is entirely unobjectionable. That so many got so riled up over this whole thing... I guess the summer stupid season isn't over yet. Wasn't there a state-of-the-nation address on or something that people should have been paying attention to? * Don't answer this last part if you live in Stonefields. While Government must balance potential revenue with the costs of collection when considering the GST loophole, the negative effects on local retailers are an important part of the equation. Difficult conditions for local businesses have flow-on effects that impact the whole economy including reduced employment (which results in reduced consumer spending), lower tax revenue and empty store fronts in our town centres. GST is not a new tax. Introduced in 1986, New Zealand’s simple and broad-based GST policy was the envy of Australia and the United Kingdom. It was, until the advent of e-tailing, an easy to use and fair system that applied to all good and services consumed by New Zealanders. The internet means that consumers are now able to easily avoid GST by purchasing from offshore retailers online, and they are doing so in droves. Nielsen estimate New Zealanders spent $1.3 billion on purchases from offshore retailers in 2013 and this is only expected to grow. The confusing variable de minimis level for GST and duty on offshore online purchases further complicates our otherwise simple consumption tax system. He goes on to make some reasonable points about Retail NZ's role in informing consumers about the benefits of buying locally. That's all fine; I'm happy with whatever choice consumers want to make about paying more and having all the local service or buying from overseas and potentially having warranty problems. But I'll disagree that negative effects on local retailers are that substantial a consideration. Really, we need to be minimising deadweight costs here. The absence of GST on imports means some things get imported that, in an ideal world, would be purchased domestically. This distortion is inefficient relative to a blackboard ideal. But some inefficiencies are best left alone - where the cost of mitigating the failure exceeds the cost of the deadweight loss, it's best not to mess with it. I've yet to see a mechanism for collecting GST on low value imports that does not induce more distortion in favour of NZ retail than the current system applies against NZ retail. If somebody comes up with one, fine. But just insisting that GST be applied without specifying a mechanism for doing it smacks of protectionism, not playing-field levelling. Rob Salmond also took issue with my piece, though I'm not convinced he read more than the bits I'd excerpted for Offsetting. The Standard thought Salmond worthy of reposting. I left the comment below there for Salmond. If you check the full op-ed piece, you'll note that my main argument is about the hassle cost that GST collection would impose on NZ consumers. I argue that the GST difference is trivial relative to the magnitude of savings from shopping online, and that retailers looking to blame the GST are missing the bigger problem of economies of scale available abroad. You'll also find that I support applying GST on imports IF there's a mechanism that would impose no hassle costs on consumers and that wouldn't just eat up all the revenue in transactions costs for the government. I'm not sure why you characterise the argument around extra customs fees as slippery slope. The Customs fact-sheet dated November 2014 says that they collect those two charges whenever they collect GST. I hardly thought it unreasonable to expect that they would continue with that practice. It's always possible that the government could tell them "And, don't charge any fees for collecting $15 on $100 purchase", but that just shifts the collection cost to the broader public, and it wouldn't be trivial. If the existing fees are cost-recovery per transaction, think a bit about how much the Customs budget will have to hike to cover $37 in real costs per processed transaction if they have to process all of them and are barred from recovering the cost. We can ban customs from charging for it, but we can't wave a wand to make the collection costless. We just change who pays. But, again, that isn't the crux of it. Rather, it's the differential hassle cost imposed on online shoppers purchasing from abroad when they have to jump through additional GST hurdles. Hey, if you come up with some actual real-world mechanism that works, that's great. I expect that if any such mechanism existed, IRD would already have done it. But you could be an entrepreneur in this space. The other main point is that NZ retailers may be deluding themselves by laying blame on GST when the price difference between NZ retail and shipped-to-my-door-from-abroad is often 33%-50%. Rather, it's economies of scale from abroad that are the main source of the cost differences. Anyway, you might check back on the full piece I'd written and linked. I say pretty explicitly that I'd support GST on imports were there a way of doing it without effectively just putting up a big hassle-cost non-tariff barrier. I'm curious about your source on Amazon's willingness to collect foreign taxes. If it's just that Amazon.co.uk collects VAT on goods shipped from the UK to other parts of the EU, I'm really not sure that's the same thing as Amazon.com agreeing to collect NZ's GST. Finally, I'll note that where the NZ market is often pretty small and cannot sustain that much competition, it's fringe competition from online imports that help to constrain domestic prices. Make low-value imports a hassle to parallel import, and I'll bet you'll start seeing hikes in the local prices of those products. I was surprised on Monday that the flag at Parliament went to half-mast for the Saudi dictator. Graeme Edgeler pointed out on Twitter that the flag does that on the death of every head of state. I suppose if you do it for one, you kinda have to do it for everybody. Otherwise, you wind up in a big Parliamentary scrap on the death of each and every foreign Head of State. Given the absence of Twitter outrage over the flag-lowering for equally repulsive Hugo Chavez, I expect the general outcome of a "recognise some" rule would be mouth-frothing at the death of every US-allied dictator and silence on the death of every left-wing one, until the whole thing turned into team-based culture wars with the right working to object as strongly to the death of the next socialist tyrant as the left had objected to the last US-allied tyrant. And that would be no fun at all. I'd prefer a no flag lowering rule. But I'm not sure that wouldn't unravel were there to be a Commonwealth PM, or American President, who died in office. And as soon as that happens, we're back to the bun-fights. Sending the NZ Governor General out for the funeral does seem a bit much though. Not much we can do about Club State always choosing to mourn other Heads of State. At least in the movies, Mafia families would always show up to pay their respects to fallen heads of other families; States are gonna State too. But we can choose how we interpret those symbols. The Herald picked up that tweet; they didn't note it was a tweet. I'm cool with that, but I'm not sure I'd be always happy with other tweets being cited as though they were official NZ Initiative comment. I'd had tongue-in-cheek comments in twitter replies last week suggesting that instead of reducing immigration to ease pressure on housing, we could deport anybody who objected to a notified consent, whether or not they were NZ-born, which would both free up one NZ house AND make it easier to build new houses. In case it isn't clear, that's neither my official position nor that of the Initiative. But it is kinda fun to think about. Update: Thanks to Stephen Hickson for pointing out that the first line in the paragraph above was originally missing the critical "not". While pretty much all goods and services consumed in New Zealand attract GST, imported goods under $400 are GST-exempt; IRD generally reckons the cost of collecting the tariff to be higher than the taxes collected. Does this create an uneven playing field for New Zealand retailers? Yes, as compared to a world in which tax could be collected costlessly. But consider the real world! Ordering higher valued products from abroad means they will be held up at Customs until GST is paid. The quickest payment option is the online credit card service which attracts a 2.5 percent convenience charge. Internet bank transfers are cheaper, but require the customer to take the separate step of logging into online banking, making the payment, then waiting for Customs to notice that payment has been made. Or, you can drive across town to your nearest Customs office. All of these methods also attract a separate Import Entry Transaction Fee of $29.29 (including GST) and a biosecurity levy of $17.63, regardless of the value of the import. That hundred dollar import that was undertaxed by $15 suddenly would attract not only $15 in GST, but also $47.29 in transaction charges. It often seems like local advocates of a lower GST threshold really just want importation of foreign goods to be such a hassle that customers give up on trying. That world is the one I lived in in Canada in the 1980s, when I would stare longingly at American computer magazines and know that getting anything across the border involved at least $200 in brokerage fees. I worry that too many local retailers focus on the GST issue when the underlying issue is rather more troublesome. New Zealand simply is not large enough to be able to achieve the economies of scale that foreign warehouses enjoy. Even if GST could be applied on foreign imports, today, with zero hassle-cost imposed, the foreign cost advantage is not likely to decline over time. The problem really isn’t the GST, or at least not in cases where consumers can easily save at least a third by shipping goods in from abroad. Domestic retail of easily shipped goods that do not require specialised local advice is not going to get easier. Recognising that rather than blaming the GST will be an important part of a reality-based reassessment of retail opportunities in the coming decade. A modest proposal for internet tax parity. Yes, the Motu report on the costs of Auckland's urban planning regulations does not include a measure of the benefits. In some cases this will not matter much; in others, it might. Andrew Geddis focuses on building height limits which impose about $18-32k per apartment and chides me for ignoring the benefits of those for the potentially otherwise shaded. But look at the main cost categories in the list. Floor-to-ceiling height limits impose $21-$36k per apartment. There is absolutely no offsetting benefit of floor-to-ceiling height limits that is not fully incorporated into the price of the apartment. Sure, the eventual residents will get some value out of the higher ceilings, but there will be plenty of buyers who'd have wanted to save money and to have a lower ceiling. The costs have to be in excess of the benefits for these things. There is no external benefit that comes into play. And same for balcony area regs that tally $40-$70k per apartment. The only people benefited by these regs are the ones buying the apartments. In the absence of this regulation, they could either buy an apartment with no or small balcony, and save $40-$70k, or one with a big balcony and pay the extra. Some people will be made no worse off due to the reg, as they'd have bought a big balcony anyway; others are being forced to buy a Mercedes when they really wanted a Toyota. These were two of the biggest per-apartment cost items, and there is no way that benefits can possibly exceed costs unless we think people buying apartments systematically err on the side of buying ones that are shorter than they really want and with less balcony than they really want. In all these cases, the ideal measure would be a net cost one that said "Ok, so we forced you to buy a Mercedes instead of a Toyota and so you're going to be paying a pile more in mortgage interest than you otherwise wanted, and it's going to cost you more in fuel too. But let's think about how much more fun you'll have driving that Mercedes and count that against the extra price we forced you to pay. And let's think too about how much nicer the place looks when we don't have a bunch of Toyotas driving around." And sure, you can get some non-crazy benefits from things like viewshafts that wind up putting in height limits. But prior to the Motu report, planners were operating in absolute ignorance of the costs these things imposed. Nobody had any clue; the Auckland stories I've heard suggested that they then didn't put much weight on that there could be any cost. Now they can at least look at the existing viewshafts, tally up the costs they impose, and start thinking about whether it's really worth tens or hundreds of millions of dollars to maintain particular views from particular places. Per unit apartment costs in high-demand areas line (sic) Parnell would certainly be lower if the developer could build 30 or 40 stories of apartments there, right. And the homeowners of Parnell hate the RMA and its requirements for consent before making a greenhouse, right? But I'm willing to bet the homeowners of Parnell aren't at all in favour of having their tomatoes' sun blocked by a series of large apartment blocks. Dilemma, dilemma. Which actually is a part of a wider dilemma. Because everyone wants "affordable housing", so long as it doesn't cause the current value of their home to go down. Which, in a housing market that in Auckland is looking more and more like a bubble, poses a real problem for policies that are aimed at increasing housing affordability. There is a way around this. Upzone EVERYTHING, make everything tall be subject to notified consent, but restrict standing for objection to directly affected neighbours. And, make it easy for developers to buy options from neighbours saying "Ok, I don't know whether I want to put an apartment building here. I'm paying you $1000 now for the following deal: if I build it, I pay you $50k compensation and you don't object; if I don't, you keep the $1000." If standing for objection is limited to those directly shaded and incurring real effects rather than made-up stuff, this can work. If councils are determined to commit absurdities, they’re going to do it regardless of fixes to the RMA. After whatever legislative tweaks are enacted, and new Environment Court rulings come through, it will take councils a little while to figure out how to restart the micromanagement that pushes up costs and helps make New Zealand the seventh least affordable place to live in the world. Councils don’t care about the effects of their planning rules on the macroeconomy, what it does to Reserve Bank policy, or whether it utterly ruins the economy. For them, that’s all under a great big Somebody Else’s Problem shield of invisibility. Councils’ problem is making sure that councillors get re-elected. That means not hiking property taxes too much (and so loading costs onto new developments) and making sure that the short term interests of current voters, and of the loudest voters, are prioritised over the interests of those who might be in town after the next election, if development were allowed. Dumb rules that hike costs could be the desired outcome, not an unintended consequence. This basic calculus will not change much until councils’ incentives are fixed. Read the whole thing, or, better yet, subscribe to Insights! Some reports make you want to find a city planner and beat it with a heavy muddy stick. Arthur Grimes and Ian Mitchell's latest MOTU report is the latest. They demonstrate just how badly Auckland Council has wrecked housing affordability. Stupid "it was a good idea at the time" rules compound on one another to make it impossible for developers to innovate in providing affordable housing. Read the whole thing. But Table Two has the main effects. Every one of these things would have seemed like a good idea to somebody at the time, but nobody stopped to think about the cost. Floor to ceiling height limits appeal to planners who think that it's not fair that poor people's apartments would have low ceilings; they ignore that tenants could otherwise choose between higher ceilings and higher rents and lower ceilings and lower rents. Some people prefer the cash in hand; planners imagine this stuff's costless. Minimum balcony area regs appeal to planners' sense of aesthetics; they ignore the cost and cannot imagine that others might prefer the cash. Delay is costless to planners, who imagine the costs of a poor (ie, not what they like) design to be huge because buildings last a long time. In some cases, developers felt that they may even face additional challenges gaining planning consent if their proposal includes innovative solutions that are not typically included in other developments. Specifically, developers considered that being innovative in order to reduce cost heightens the risk and uncertainty when trying to obtain a consent, both in terms of the time required to work through the consenting process and the ultimate outcome in terms of the number of dwellings. Developers commented that urban designers do not like small uniform dwellings which are easy to produce and which reduce costs. He also specifically cites Grey Lynn people as part of the problem around NIMBY activism. While I broadly support Nick Smith's look at how the RMA might be fixed so it stops enabling this kind of Council ridiculousness, I doubt it goes far enough. Underpinning all of this is that Councils have zero current incentive not to behave this way. The RMA was never intended to enable this kind of mess; planners used it to set rigid district plans and to fob off blame for lengthy processes. If Councils instead had better incentives, so that growth were in their interest instead of just NIMBY-appeasement, we'd have better outcomes. New Zealand is the 7th least affordable place in the world to live. Bad urban planning takes a good chunk of the blame. * I'm not exaggerating. That was one of the reasons behind Christchurch CBD height limits. Never mind that it's developers' money on the line if they're the ones wrong about what customers might want. I'd love to see somebody else head into the Stats Datalab and do a bit more digging into recent declines in teenage fertility rates. Teen fertility rates are down but we aren't entirely sure why. The new report commissioned by the Social Policy Evaluation and Research Unit notes increased use of contraception but doesn't have any clear reason why contraception use has increased. They note the link between deprivation and higher birth rates; it would be interesting if they presented results sorted by income cohort. The time path has a sharp drop from the 1970s through the early 80s, then a slow decline, then a sharp rise from '05 to '08, then a reasonable decline since '08. I wonder whether changes under National restricting the generosity of benefits paid to single mothers who have an additional child while on benefit have had an effect on teen birth rates. Please go and make this your thesis and report back. The ODT's Eileen Goodwin asked me for comment on CEO pay in New Zealand; I'm quoted briefly in this story. Here's what I'd sent her; the ODT story wasn't able to include any of it but did quote from our prior phone chat. I wish she had made some use of the data I provided on top-1% earnings for context though. We should start by looking at whether there actually has been any great increase in earnings in the top 1% relative to others, just so we have the data right. I created this chart from the World Incomes Database. You can check my numbers at http://topincomes.g-mond.parisschoolofeconomics.eu/#database . The only difference between those figures and mine is that I averaged incomes between 1999 and 2000 for everybody, because the change to the 39% top marginal tax rate had a pile of people bring forward income to 1999 from 2000, making 1999 look super rich and 2000 super bad. Best is then just to average the two. I set everyone’s income in 1953 to be equal to 100 to get an index score, then looked at growth from then onwards relative to the 1953 baseline. That makes it really easy to compare income growth in different cohorts. Note that these are real inflation-adjusted figures. As you can see, there is zero evidence of any blow-out in top 1% earnings in New Zealand. Since 1953, real earnings in the top 1% are up by 50%. But real earnings for the bottom 90% doubled. This is further confirmed by the Ministry of Social Development’s recent report. You can check it at the link; I’ve pasted the relevant table below. "Overall, there is no evidence of any sustained rise or fall in inequality in the last two decades. The level of household disposable income inequality in New Zealand is a little above the OECD median. The share of total income received by the top 1% of individuals is at the low end of the OECD rankings. Note: See the main report for details about the sources for the figures in the above tables. So, top 1% earnings here are hardly high by either a historical comparison within New Zealand, nor by any international standard. And inequality in New Zealand is middling by OECD standards. The MSD report also points out that while wealth inequality is higher than income inequality (and data on it less reliable), what we do know about it is that the top decile’s wealth share here is about on par with France and Canada, and lower than Norway and the US. Further, when we account for that much of the country’s wealth is held in the form of mortgage-free houses by the elderly who have low incomes, the joint distribution of wealth and income is far more equal than if we look at wealth alone: a lot of people with high wealth have little income. In my view, inequality has taken on a lot of salience in New Zealand for two main reasons. 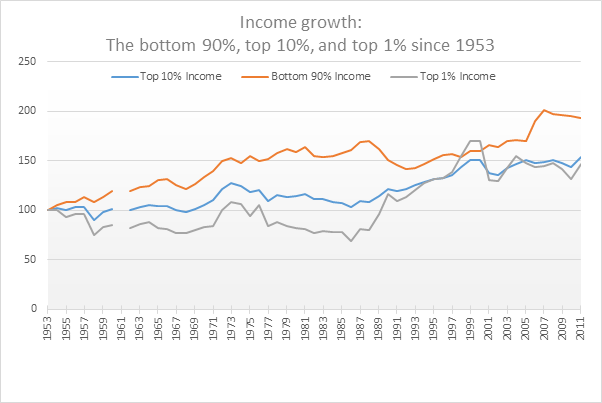 First, inequality in the US has risen substantially – though not here. New Zealand is way too quick to assume that whatever’s happening everywhere else is also happening here. Please look at the data above and help people to at least base their opinions on what the data actually says about things here. Second, the ridiculous run-up in housing prices, due mostly to Council restrictions preventing new building, has made housing really really unaffordable for a lot of even middle- to higher income New Zealanders. They then blame richer people for bidding up the price of housing – and they’re especially prone to blaming rich foreigners. It’s right to be concerned about housing costs, and especially about that housing costs eat up way too much of household incomes for lower to middle income families. But that’s not a problem with inequality – it’s a “not building enough houses” problem. With that established, let’s look at some of the evidence on CEO compensation. Edward Glaeser Kevin Murphy finds that executive compensation in the US is strongly related to firm performance. See the first paper in this set. Adams et al find that Swedes with higher cognitive and non-cognitive abilities get put in charge of larger companies. Better CEOs sort to the bigger firms where their skills are more needed; CEO pay then reflects both their abilities, and the size of the firms they have to manage. Kaplan and Rauh find that top CEOs have been gettingbigger pay packets largely because the market has gotten a lot bigger and morecomplicated: the CEO job has gotten harder at large firms, and so the gains from having the best people have gone up too. Again, this is consistent with the view that shareholders generally do well in keeping an eye on their boards, that boards pay what’s necessary to attract top talent, and that the importance of having strongly performing CEOs has increased. Another way of testing? What happens to a firm’s value when the CEO dies unexpectedly. Here’s Nguyen and Nielsen. In short, there are sharp drops in firm valuation (share price) on the death of a CEO. They argue that for every extra dollar of wealth that a CEO creates for the company *over and above what someone else in the job would have created*, that CEO keeps about $0.75 and shareholders get $0.25. Other papers using different measures find that CEOs keep a much smaller fraction of the wealth they create for shareholders; the high estimate here may reflect some drop in value due just to the uncertainty about who the successor will be. If there are problems in CEO compensation, they will be specific to individual firms. If a CEO has managed to pack the Board with friendly supporters, that CEO could be getting paid far more than he or she deserves. That makes the case not for any kind of blanket rules on CEO pay but rather for making sure that corporate governance is strong: that shareholders maintain control of the firms they own, that Boards are active in monitoring performance, and that shareholders sack Boards and CEOs if they can get a better deal elsewhere. It's always interesting to keep track of what bits get used and which bits don't. Update: for the benefit of those who, like Keith Ng, seem to want to assume I did something dodgy in choosing 1953 as a baseline year, go and check the original source data. The basic reporting unit changed from 1952 to 1953 so the data isn't consistent; they have 'em as different data series. I chose 1953 because it was the earliest consistent year in that dataset; I chose that dataset because it's the longest term data I've yet seen on income distribution in New Zealand. Maybe Keith would be happier with a 1984 base year because then he could be all mad about income increases for the top 1% in the late 80s; maybe somebody else would like a 1999 base year so they could be all mad about income declines for the top 1% since then. The nice thing about choosing the longest possible data series is that anybody can then truncate it to later points if they want to think about alternative base years. I'm hardly hiding the increase in top 1% incomes in the late 80s; I'm just failing to hide the prior long term decline in earnings among the top 1%. Update2: Keith's only unhappy that I took 1953 as base year, not that I included the full data series. People can use whatever base year they want. In absence of some big reason for picking one over another, I go with the earliest; you can easily run ocular re-basing to whatever base-year's desired.